The day today started with a trip up to the top of another extinct volcano. The mountain top wasn't as big as the one yesterday; however, once at the top, one could see pretty much the entire island of Santa Cruz including the town I am staying, coastlines, and boarders of the national park. I was also able to see a giant sinkhole about in the middle of the island that was to be my next stop. 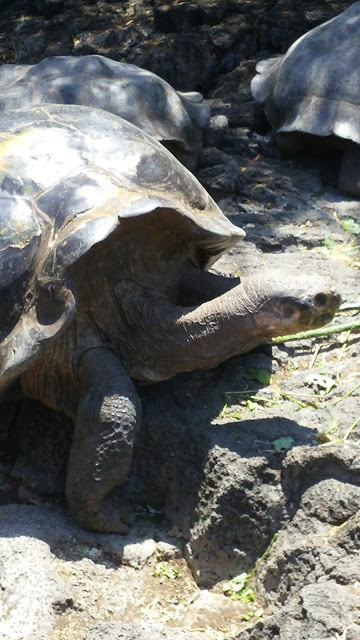 Nearly 97-98% of the Galapagos is national park land which is quite impressive. In order to see not just one sinkhole but a few, I had to enter the park's gate. 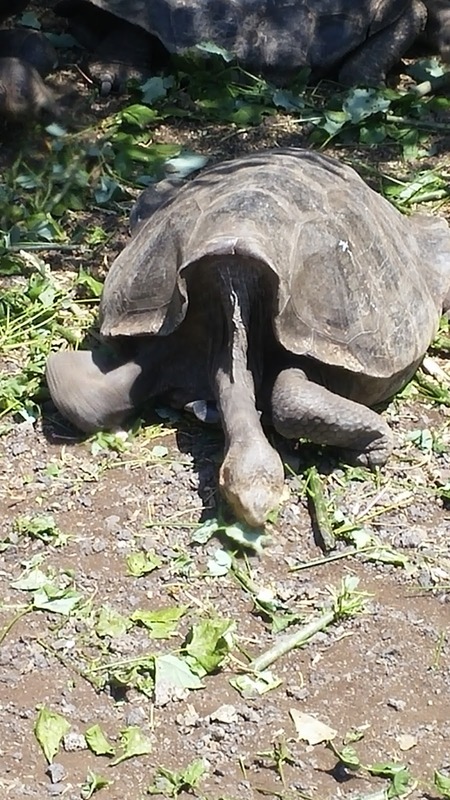 While driving to the park, I noticed a few giant tortoises crossing signs which I thought was unique; probably will never see those any place other than the Galapagos. A small hike took me to a giant sinkhole. Sinkholes are created when the ceilings of lava tubes/tunnels under the ground give way, creating sometimes small or in this case large holes. The guide also pointed out how the black raspberry (an invasive species) has taken over the land. This was mentioned to me before a few days ago. Also, cedar trees that grew tall around the hole (crater only for volcanoes) and elsewhere on the island where introduced and causing problems with the acidity levels in the soil. We went on to find another sinkhole that was created in the same way; however, one could notice that it was really two sinkholes that had merged together. Along the sides of the holes, you could see lava tube openings. 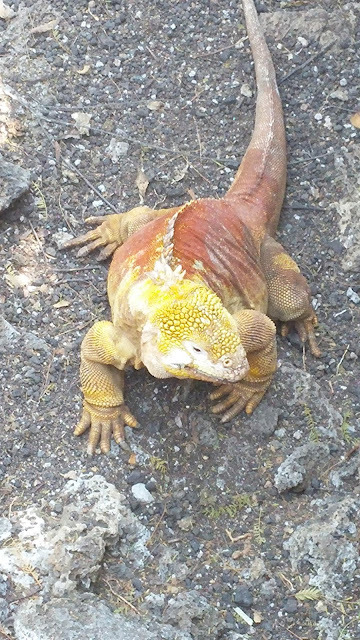 After the trip to the sinkholes, passing a banana farm, and dodging a herd of cows being prodded by a farm hand down a dirt road, I ventured into a park that advertised giant land tortoises and lava tube explorations. Once in the park, I hiked along a field to find several giant dome-shaped tortoise eating and taking mud bathes. It's interesting in that the animals are free to roam anywhere which meant the farmers or property owners must allow enough room under their fences to allow tortoises to pass; I caught one doing just that. After viewing the tortoises I went down into a lava tube that was created by a flowing stream of hot lava surrounded by cooler lava millions of years ago. You could easily see the markings and traces of ancient lava flows while exploring the tube. It's a reminder that the Earth once was, still is, and always will be... on the move. The day ended with a boat trip around the bay where pelicans were diving for fish only a few feet away and blue footed boobies were nesting only a few yards away along cliff sides. My guide talked about the history and culture of the island as we went along the side of the bay and harbor. We ended up going ashore and hiking a couple miles inland to see mangrove trees where egrets from the highland would come to roost every night. The mangroves also provided excellent sea turtle nurseries. As I walked along a small beach, areas were roped off to give privacy and care to areas where iguanas had laid their eggs. I ended the hike near a long fissure where some local people were swimming and then on top of a cliff overlooking the bay and harbor that I just patrolled around in earlier. So the day was quite full and adventurous as usually... can't believe that tomorrow is my last full day here. Anatomy of a tortoise shell. I wanted to provide this to you to help explain that the age of tortoise can be somewhat determined by rings within the hexagonal plates on the upper shell or carapace. As the plates grow, the rings go away making it harder to determine the age of the animal. Good day.... boy it's hot here :-p So today just outside the city I visited a cultural center that explained and presented some of the history of the Galapagos including the geology, nature, and people. After the center, I walked about 2-3 miles amongst some native vegetation to a couple of outlooks up along some cliffs. After a few moments taking in the cool breeze from the ocean and the spectacular scenery; I did some more snorkeling along a very rocky bay. Hoping to see some sharks, I was left with just some parrot fish, sea urchins, sand dollars, and a lot of brightly colored fish. Near the rock bay, there was a very prominent statue honoring Darwin. On the way back to the center I witnessed some warblers, fly-catcher, and finishes; along with some more prickly-pear trees. Ok, so I'm taking off to do some kayaking along a bay and perhaps some swimming. Cotton Flower - notice how the pollen takes on the form of a pineapple. Now the red petals that you see in the center will actually dominate the white and the full bloom of the flower will be red. Flycatcher Bird - but what was interesting about him was that he looked dead on the trail.... I mean his wing was misplaced and his beak was open; however, when I got closer... he took off. Guessing he was playing "opossum" as a defence mechanism. A tribute to Darwin along the trail today. Female Frigatebird - you can tell by the white band around the neck... males will have a reddish pouch under their necks. "May I Introduce to You, the "Galapagos""
Lizards come to the shelter of the bushes along the beach during the night. They leave it to feed on algae under water in the morning and afternoon. Sea Lion basking in the sun. This was one of several on the beach that day. Again, you could literally touch them if you wanted, but again... highly highly not recommended. In fact, I noticed a park ranger off to the side under a tree to keep an eye out for those that violate the island's law. 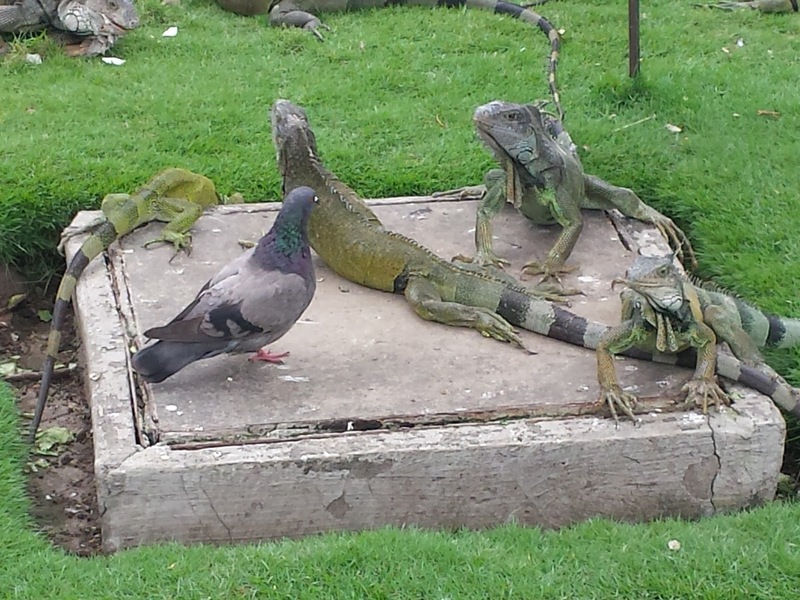 The first marine iguana I saw ..... excellent !